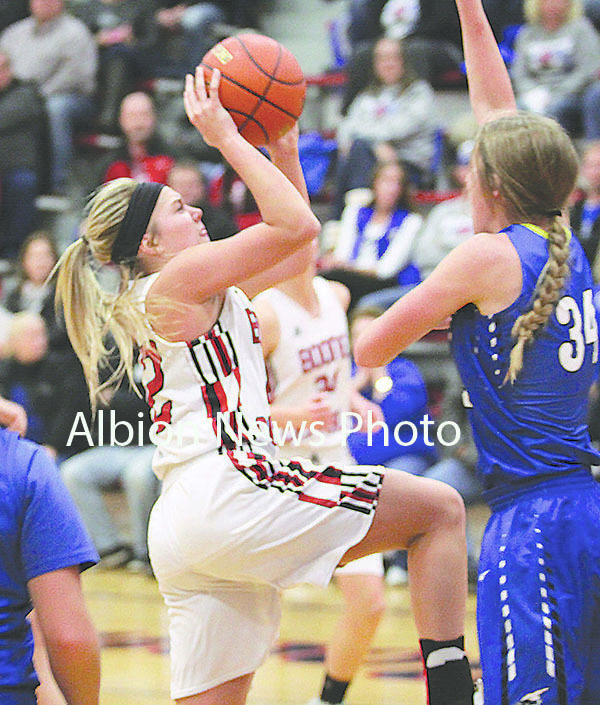 It was not only a busy week, but a difficult one for the Boone Central/Newman Grove Lady Cardinals, facing some of Nebraska’s best Class C teams. BC/NG hosted Class C2 #1 Crofton Tuesday at Newman Grove and lost a 67-38 decision to the Lady Warriors. The Cardinals had a solid start, but couldn’t keep pace with Crofton’s aggressive pressure attack. “The bottom line against Crofton is surviving their first wave of attack. They thrive off dictating tempo with the aggressive style of defense,” BC/NG Coach Andy Imus said. “We started off well and ran a pretty good offense that saw decent ball and player movement, taking an 8-7 lead. “That lead was erased, as we lost the flow we created offensively and settled for low percentage shots. We had eight first-half turnovers that led to easy transition points for Crofton. Crofton created 14 turnovers in the third quarter and we could only muster two points. Crofton’s grind started to wear down our girls mentally. Boone Central/Newman Grove hit the road Thursday and earned a big 60-55 victory over host Central City – a team that knocked BC/NG out of last season’s sub-district tournament. The Cardinals had a hard time stopping big Bison pivot Katy Gathje, but used offensive balance of their own to make the difference. “We had trouble the whole game stopping Gathje. She had nine first-quarter points and really owned us in the paint area,” Imus noted. “Our lack of strength and physicality were exposed against her. BC/NG (2-3) returned home Friday to host another state-rated squad in Class C1 Pierce. Although the Cardinals battled gamely, a slow start and sluggish finish doomed the hosts to 52-41 loss. “The girls found themselves down 17-8 after the first quarter. Once again, our post defense was exposed, so as coaches, we need to do a better job of teaching what to do to be successful,” Imus commented. “We outscored Pierce 28-21 over the middle two quarters. We did some good things during that stretch, including taking care of the ball and good ball movement for high percentage shots.